Well done to Gary Towers, all our volunteer coaches, and to the parents and players at the Club’s weekly GoalAbility sessions. 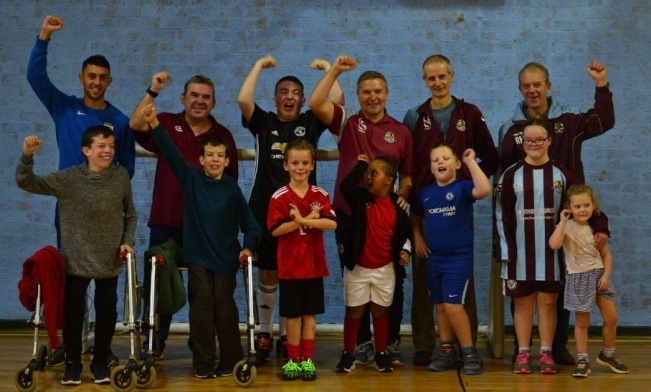 The Club delivers disability football sessions for children up to 16 in our local community. Tuesday night was a memorable occasion for the Bedfordshire FA. Luton Town FC were fantastic hosts for their annual Community Awards celebrating the amazing work around the county. Award winners (including GoalAbility) were invited to the stadium for drinks and a pre match meal as they collected framed certificates before the big game. Amongst a superb performance form the Hatters, the winners were invited onto the pitch at half-time under a round of applause from the crowd. A thoroughly enjoyable event all round. Congratulations to all the award winners this year, but especially to our own GoalAbility team. Truly inspirational and a superb advertisement for our Club.